If you have small children, you might wish your company did more to help. You might wish it was like South Korea’s NCSoft. 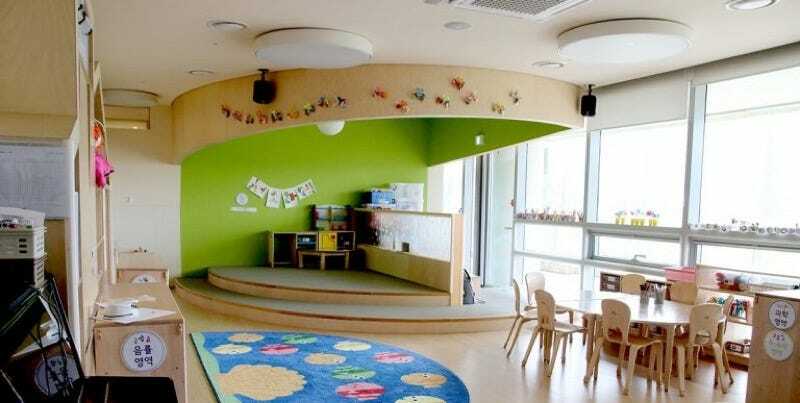 As reported on Korean site Pitch One, via tipster Sang, NCSoft has a pre-school called “Smiling Peanut” that is located at the first and second floors of the company’s headquarters. Smiling Peanut is dedicated to taking care of the employees’ children, and it has 180 students, ranging in ages from two to seven. Lessons are also in Chinese and English, and the school records all the lessons to help teachers improve. According to Pitch One, this is the best pre-school in South Korea. It’s free for NCSoft employees. There are extra fees, however, for extra curricular activities. To prevent overworking the teachers, the pre-school has a staff of 55, which includes teachers, physical education teachers, nurses, and cooks. The kids get regular check-ups by the nursing staff to ensure they are healthy, and the children are only served organic food. There are two full-sized basketball courts and a playground outside to keep the children active. As great as this private pre-school seems, South Korea is also dealing with a public pre-school crisis because the government wants to slash the budget in half. In protest, pre-school teachers across the country are going on strike tomorrow.